When I finally broke down and got my daughter an email account (all my friends have one! actually does work sometimes) we had the long, requisite discussions about safety, etiquette, and responsibility. But wow, it turns out there’s so much more than that. Especially because most of her friends seem to have been given accounts without any tips or tutorials at all. No judgments there; it’s just that I think email seems so everyday to all of us, and some of the protocol is now so intuitive, it hasn’t even crossed most parents’ minds. I mean, I still remember learning how to answer the phone properly: Hello, this is Liz speaking, who may I ask is calling? Are we doing something similar when it comes to email for kids? I’m guessing maybe not as much as we should. 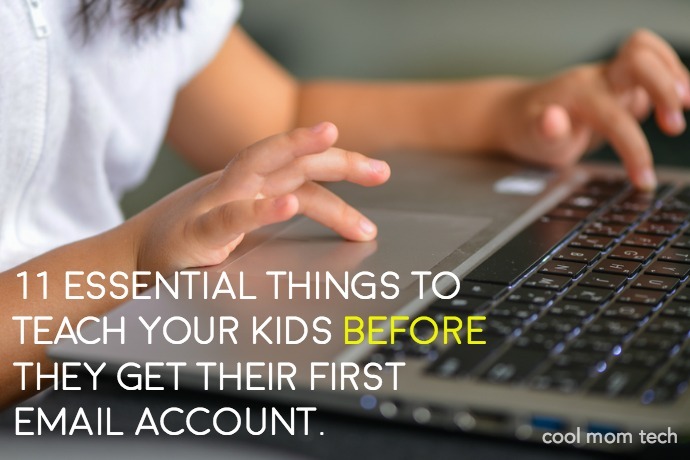 Whatever email your kids are using — and I can offer up some smart options for that in a separate post — I wanted to share some of the surprising things I learned I had to teach my daughter when I set up her first email account. It’s not all about safety either; we also have to teach kids about common etiquette, and just understanding how things work in the email world. And no judgement about how old your kids are, or how they use email. I just wanted to put some tips out here that I hope will help more parents. First and foremost, I set up a forwarding option so every single email my daughter receives hits my inbox too. I tell her to inform her friends that I see all of the emails she gets from them — no sneaking, full transparency. While this isn’t a great plan for a teenager, for a fourth or fifth grader I think it’s totally appropriate. And without this plan, I wouldn’t have learned so many of these watch-outs in the first place so that I could help correct them. This is probably a duh, but it still bears repeating. It’s not that your kid’s handing our her address to strangers on the street willy nilly; it’s just tweens are so understandably excited to have their own email addresses for the first time, they need to be reminded not to use it to sign themselves up for services, games, or “free” anything online. It’s a tool for communication, not a key to access more internetty things. Which brings me to the next point. While my daughter knows about why not to sign up for things online with your email address unless I okay it, what I never even considered were that her friends hadn’t been given the same warning. So I was floored when one friend told her he had “signed her up for 50 free songs on this new service just by giving them your email address!” Forehead slap. I sat them both down together and we had a good talk about what happens when you share an email address with companies, why they are collected, and how emails are sold for profit. Her friend found this so hard to believe, that he insisted they just delete your email address after you get your free songs. (Kids: They’re so cute.) Then we had the “you never get something for nothing” discussion. Now, my daughter knows that a requirement for giving out her address to friends is explaining that A) her mom reads her emails, and that B) they are not allowed to share it. I laughed so hard when my nieces received my vacation auto-response email and wrote back to me, “we’re sorry to disturb you, we didn’t know.” Kids don’t inherently understand what an auto-reply is, or that sometimes even emails that seem to come from a person are not coming from a person. Show them newsletters or subscriptions you receive from users like no-reply@______ or notifications@_____ as a clear example. Similarly, when the girls get a bounceback email from a faulty address (go figure, sometimes ten-year-olds type in their addresses wrong) I had to explain that Daemon was not related to Matt. This is a server message informing you why your email is being returned and my kids know to check the double-check the address and try again. I suggested my daughter write back and explain that she is not online all the time, nor is she checking email all the time, and sometimes that means waiting for a response. Our poor children of the Immediate Gratification Generation! Waiting can be so hard. Because my daughter doesn’t have texting privileges, she and a few friends have some long, crazy email chains. I explain to her that this is a good time to use “reply all” — because everyone is on the thread together. However I’ve also showed her how to just use “reply” if she needs to respond to one person privately. Not to talk about the other kids behind their backs, but to say something like, “hey do you want to have a playdate?” Alternatively, I explained that she can start a new thread for that. Speaking of threads, it’s good for kids to understand how that works, and how certain email services or clients sort a conversation chronologically, based on subject line. This can also start making the thread unwieldy when it goes on for days. (Again, emailing is not texting.) If your kids are using threaded emails, it’s also good to show them how to delete the earlier conversations that appear at the bottom, so that each email isn’t a mile long. In a page out of the Mean Girls handbook, I had to explain what CC (carbon copy) and BCC (blind carbon copy) mean and how they are used in business. How they are not to be used is to blind copy friends on private messages to other friends for the purposes of being a jerk. I want her to know that I take this very seriously, and so I make it a point to talk about it now. I’m lucky that she’s still at that lovely pre-teen age where she’s horrified by the idea. I swear, she collects them like it’s change on the sidewalk or shells on the beach. Alternatively, I let her know that she can file special emails she wants to save into folders, to at least get them out of her inbox. If she takes after me, she will never get to real inbox zero, but I’m hoping she can surpass me in that department. Emails, texts, and photos that you think are private can get out. So never ever send a photo, a mean note, or anything personal that you would never want to become public. I know this is wildly idealistic and a bit hyperbolic, but my hope is if she understand the premise from the start, my daughter will always have it in mind as she gets older, and it will help guide her in her choices as she explores more social media with more freedom. What can I say, I’m a writer. This is one of my favorite all-time notes that my nine-year-old emailed to a friend, for more than a few reasons. 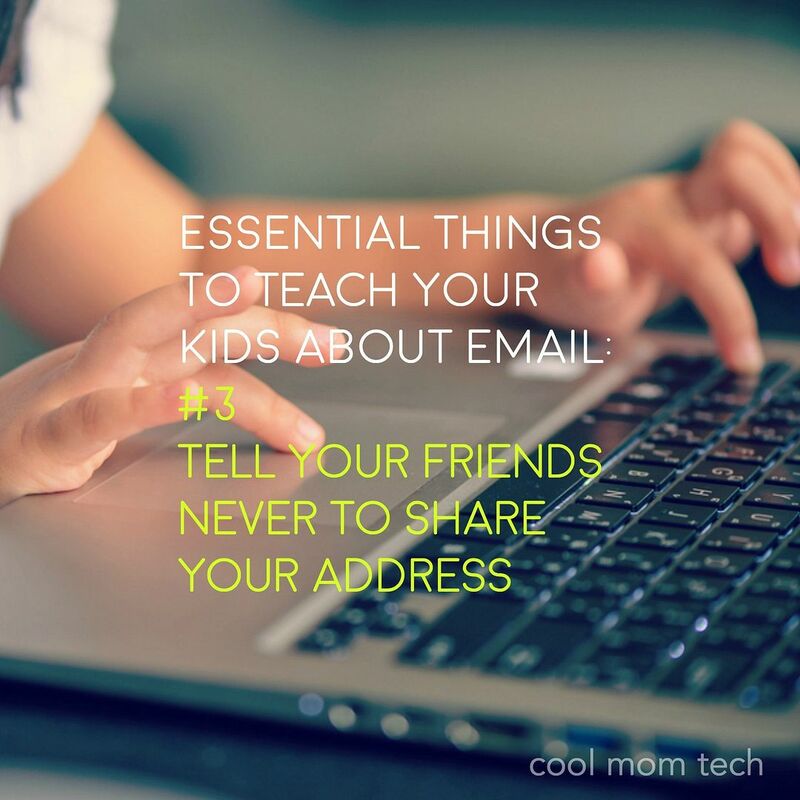 Do you have any tips or advice you give to your own kids about email? We’d love to hear it! This is great! My daughter is still a few years away from me handing her the keys to her email account, but you’re right – this is stuff I can already talk to her about! Thanks, Liz! This is a great list, I have said many similar things to my daughter, and she gets it. I would love your thoughts on the best email program for pre-teens. My daughter is 10. Came across this and it’s a really good read. We used a service called Topmail to set up accounts for our kids, much safer than other more common options for safety and privacy. Can you recommend the best email services for kids?